This text is based on 2 years of practical experimentation with the participation of secondary schools, teachers and young students from all across Europe.The aim of the text is not to summarise or evaluate the project’s accomplishments, but to paint some critical perspective landscapes fuelled by the project; critical as the general mentality in Europe is increasingly working against the innovation agendas promoted by the Commission. In other words the text contributes to an understanding of what further steps should be taken in the core fields addressed.Thus the text might inspire new European initiatives based on and going further than the CHRIS project. State of the art knowledge and practical experience on radicalisation prevention in schools is excellently collated and summarized in the 2016 EU Commission publication “Preventing Radicalisation to Terrorism and Violent Extremism”, produced by the Commission’s Radicalisation Awareness Network. The CHRIS project is guided and directed by this publication, which is demonstrated across the application. 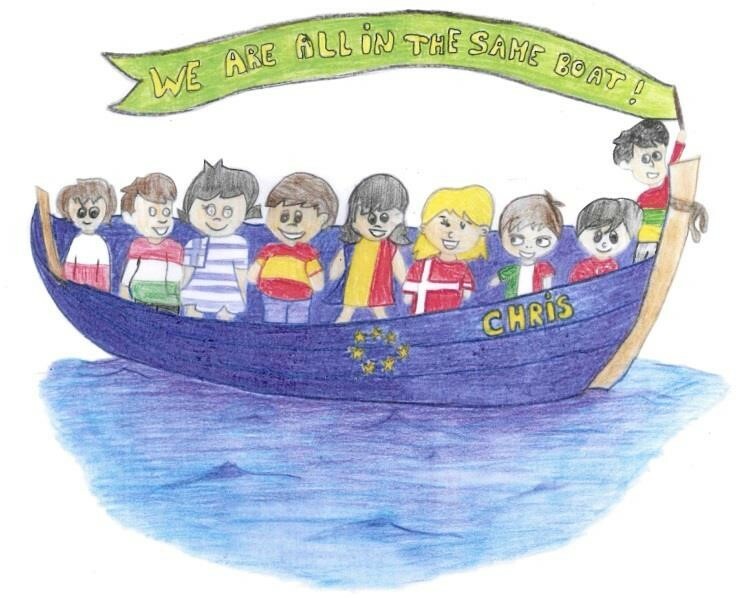 The CHRIS project is one of the first projects in Europe to take the Commission’s Young People’s Co-creation Agenda seriously and to implement this Agenda to create valuable contributions to radicalisation prevention in schools, based on the full, authentic and uncompromised co-creation of young students from a diversity of European countries.The CHRIS approach is guided by the fact that young people’s co-creation is a SINE QUA NON for efficient and future-oriented radicalisation strategies in European schools. The “CHRIS Schools” project will be followed and complemented by a “CHRIS Community” project submitted to the October 2016 Erasmus+ Youth Call and addressing radicalisation prevention in community contexts. The CHRIS project will involve young students in secondary schools in the development of sustainable ways of countering radicalisation in schools, based on in-depths engagement in what produces radicalisation potential in relation to teenage identity formation and through real-life and real-time community collaboration – and with the aim to build capacity to co-create the project outcomes. Therefore the project will take the participating young student teams through 3 phases of capacity building and co-creation: Feeling Me Feeling School (identity), Open Schooling (reality and community) and Co-creation (design of radicalisation prevention in schools). The project will build capacity and in particular critical capacity, social conscience and ability to interact among the young students to be co-creating the project results, including through virtual collaboration between the students from the pan-EU partnership and climaxing the collaboration through a 5 days intensive mobility event, the CHRIS Co-creation Encounter. The project will move radicalisation prevention beyond delivery of content and beyond punctual and event-based interventions and towards a didactic level: countering the development of early radicalisation potential through offering young people solid life-wide narratives, (gender) identities and missions, including empowering to political narratives and identities. The project will engage 2 teams of 5 young students from each of the 5 participating schools along the entire project. The young teams will be supported by 2 teachers from each participating schools. The project’s knowledge partners will guide and inspire the project practice and will work with the young teams to produce the final outcomes. CHRIS forms part of the Commission’s radicalisation prevention agenda.This agenda is not concerned with intervention once radicalisation has taken place and is acted out, but with such strategies that prevent the production of radicalisation potential.This is a totally different challenge than intervention in radicalisation acted out. It is also worth noticing that the agenda is focused on radicalisation potential, not about radicalisation.Once radicalisation potential has been produced, the young people are easy targets of radicalisation and radicalised communities. This also indicates that we believe that radicalisation will not take place unless radicalisation potential is produced: radicalisation recruitment needs something to link to in the young person. Such radicalisation potential might consist in feelings of injustice, feelings of exclusion, feelings of not belonging, resulting in: anger, frustration, confusion, hatred, humiliation, isolation, etc. and might be produced in very many social situations and in very different young people. There is no clear radicalisation production history and no clear profile of young people at risk of radicalisation. Many young people developing radicalisation potential are never radicalised.Many young profiles that we believe at risk of radicalisation are never radicalised. Sometimes young people considered not at risk of radicalisation are radicalised.The first conclusion for radicalisation prevention in schools is therefore: targeted and focused intervention in connection with young people at risk of radicalisation is not possible, as such young students are almost impossible to identify. Second conclusion is: what schools can focus on is a) help preventing the production of radicalisation potential, and b) help re-channel radicalisation potential in progress. Importantly: radicalisation in schools must be integrated in and make sense to the general educational missions of schools. Schools should not assume social roles, police roles or similar. The challenge is about offering young people experiences of learning progress, experiences of positive social belonging and possibilities to decide and interact on matters they feel essential, that radicalisation potential might not need to be produced. And if radicalisation can be noticed being in progress, it might still be re-channelled by immersive learning experiences & a social experiences providing the young student with resilient and strong subjective and social narratives. The students must experience democracy in the sense of being listened to and acknowledged as some, who contributes to the common good of society by way of interacting. The question is, of course, how can schools do that? First of all, it must be made crystal clear that such complex challenges go far beyond what can be expected from school and teachers.Second, there is not guarantee for success, even if qualified radicalisation prevention is put in place in the schools.Radicalisation and the production of radicalisation potential depend on multiple factors, and most of them are out of reach of schools and teachers.What schools and teachers can do is to contribute to radicalisation prevention and re-channelling radicalisation energies in progress. This is in itself a major challenge, as it calls for considerable didactic innovation. The first generation of guidelines and school recommendations are valuable and useful, but less focused on what we call lifelong and life-wide sustainable radicalisation prevention in schools and the creation of resilient young personalities with the capacity to immerse into constructive and reflective missions and engagements. That is, offer young people experiences of learning progress, experiences of positive social belonging and possibilities to decide and interact on matters they feel essential, so that radicalisation potential might not need to be produced. And if radicalisation can be noticed being in progress, the school might still be able to re-channel these experiences by immersive learning & a social experiences making it possible for the students to develop resilient and strong subjective and social narratives. The school can offer the students experiences of democracy in the sense of being listened to and acknowledged as some, who contributes to the common good of society by way of interacting. Such radicalisation prevention tries to target the deeper levels of radicalisation by interfering with the energetic economy of radicalisation potential. We know that even strong negative or aggressive feelings can be re-channelled in constructive directions if the proper resources and opportunities are in place. At first glance one might believe that activities in school addressing radicalisation directly are the most efficient radicalisation prevention mechanisms.Such activities might be open dialogues in the class, visits from experts or the police in the school, dialogues with community players, etc., etc. Such activities are typical today for schools engaging in radicalisation prevention. We call them traditional school approaches to radicalisation prevention.The problem is that this approach suffers from the typical Western educational misconception: that young people at risk of radicalisation can be “persuaded intellectually” to change their mind! The punctual activities approach is not able to penetrate into the deeper levels of production of radicalisation potential, the energetic economy of radicalisation potential, and even though such punctual activity might not do any harm or even contribute positively to articulate radicalisation thematics, they cannot be expected to contribute much to efficient radicalisation prevention. In short, there is – and this is the very background to the CHRIS project – a clear lack of recommendations and guidelines taking radicalisation prevention to a didactic level, rooting radicalisation prevention in work forms, engagement mechanisms and immersive real-life and real-time missions, thus countering the production of radicalisation potential. To offer young people experiences of learning progress, experiences of positive social belonging and possibilities to decide and interact on matters they feel essential. Evidently, schools cannot provide the students with such experience through classroom teaching that by the way, in its more rigid forms, tend to add to radicalisation rather than prevent it. How can schools, then, offer the young students such immersive learning & social experiences that radicalisation potential might not need to be produced? Through various forms of open schooling approaches engaging young students in dynamic, immersive real-life interaction with the community, with the real world around them – and through the social networks they are participating in 24/7. Thus, through open schooling, the surrounding community is involved in the school day in a way that supports students' learning and well-being. The open school hereby contributes to variation in the school day and to differentiate teaching, so that it meets and challenges the individual student's academic level. Why does open schooling, taking its departure in problem-based learning have the capacity to do this? However, as we shall see later, the problem is that European education systems do not allow the development of such open schooling and therefore indirectly weaken schools’ contribution to radicalisation prevention. National policy-making in Europe, including educational policy-making, is rather producing radicalisation than preventing it. There is an abstract will in European education to prevent radicalisation, but it remains without practical consequences.The European radicalisation discourse is in itself weak and questionable: in oversimplified ways it puts all sorts of “unwanted” behaviour into a single bag called “radicalisation and extremism”.This label is expected to cover all sorts of violent and unwanted behaviour, in particular among young people: religious radicalisation, sport-related violence, political extremism and all sorts of terrorism.Simplification can sometimes lead to clarification, but in this case the European simplication of what radicalisation is, is more dangerous than helpful. First, putting all sorts of radicalisation in one bag prevents us from understanding any of them, as they are totally different, emerge from different social sources and are acted out in very different ways. It seems as radicalisation is everything that is not directed towards middle-of-the-road traditional parliamentary politics, from Greenpeace to major terrorist attacks. Second, because the discourse in this way becomes moralistic and normative: radicalisation, extremisms, aggression and non-parliamentary action is by definition undemocratic and unwanted. The irony (and also the hypocrisy) might be that precisely radicalisation might be needed to preserve and defend various forms of democracy in a Europe in which many national states are systematically moving away from fundamental principles in what we call democracy. The European radicalisation prevention agenda will never be efficient if European policy-making and political institutions are not able to move away from and change their obsolete positions and practices. The European policy-making agenda is strongly linked to possible radicalisation prevention in education. Teachers are not trained for either of these challenges. They are basically trained in subject-based classroom teaching, not in handling religious extremism or organising long-term real-life community based learning processes. Already at this point we should perhaps step back and say: why are we trying to persuade pioneer teachers to engage in such more or less impossible missions? In particular as these pioneer teachers often receive little support from the school and from national educational authorities. Why are we, then, still inviting pioneer teachers to experiment with radicalisation prevention through open schooling? First of all because we believe that radicalisation prevention is imminent and urgent; second, because we after all believe that schools working together can accomplish more than schools not doing anything. What is clear, though, is that the present teacher generations will never really be able to tackle the new enormous challenges, forced upon them by the 21st century realities. The inevitable conclusion is that Europe needs a revolution in teacher education, no less! Because the teachers of the future cannot go on being trained through constantly adding new competences and new mastery; they will not be able to manage that.On the contrary, teachers’ basic training needs to be fundamentally changed to meet the challenges of 21st century teacher roles: from subject experts to facilitators of a variety of very different learning initiatives and approaches.The European Commission, and its research and education programmes, should therefore in collaboration with national educational authorities establish a very strong for example 5 years focus on the fundamental innovation in teacher education.The focus might be supported by experimentation in the research and educational programmes. A complex and pioneer project like CHRIS is not characterised by one single mission: accomplished or not. On the other hand it must be stated very clearly that the long-term, programmatic and strategic perspective in CHRIS was out of reach to schools and teachers in a small Erasmus project with very limited funding. The long-term strategic vision is radicalisation prevention taken to a didactic level through open schooling. The long-term strategic vision - radicalisation prevention taken to a didactic level through open schooling – calls for many years of research and experimentation and in particular a very strong interaction between research and practical experimentation based on students’ co-creation. It is not evident that schools have important roles to play to prevent radicalisation among young people. Basically schools and teachers are not able to tackle such challenges at all. And even more critically, one might ask: are typical schools in Europe able to work with radicalisation at all? Do they have the proper resources, the needed time, the need space for experimentation, the need support, etc.? The answer is crystal clear: of course, they don’t. So, what pioneer schools and in particular teachers are doing is to integrate various elements of radicalisation work in different subjects. Often this is about dialogues with radicalisation resources, visits to such resources – or studying a case of radicalisation. Such activities might occasionally include open discussions in the class. No doubt such activities are positive and useful – and create a general sense of and awareness of radicalisation among young people. On the other hand, such activity will not help prevent radicalisation, as demonstrated across the CHRIS research and policy papers. CHRIS did indeed qualify activities linked to radicalisation and to understanding radicalisation, but it is not possible in a single Erasmus+ project to take the giant steps from punctual radicalisation dialogues to systematic open schooling for radicalisation prevention. As long as radicalisation prevention activities in schools are based on the present resource situation, such activities should be designed and planned with caution: qualified radicalisation prevention needs at least basic resources, and if such resources are not in place the activities might make little sense. In that case it might make sense for a school to collaborate with youth organisations outside the formal education system. The education systems and schools in the Western world and in Europe are not “neutral” institutions in the societies. They might believe that themselves, but they are not. They transmit and promote a long line of Western ideologies, openly and between the lines. This might not be a problem in the everyday lives of schools, but in connection with radicalisation it is indeed a big problem. If this problem is not addressed properly, it might question the value of the entire radicalization prevention mission. Because one of the most fundamental conditions when working with radicalisation is something that normally never happens: we need to put all the explicit and implicit values of our dialogues and context on the table! If not, the dialogues are not free, open and credible. This means first of all that the schools, on behalf of the education system, need to put its values, ideological bindings and half-hidden agendas on the table. This is not easy, and normally it does not happen. Did it happen in CHRIS? What kind of things might be put on table from the education system? To be fully fit for working with a sensitive and demanding theme like radicalisation, the education system needs to deconstruct itself at all levels: from research and policy to the individual teacher, also to enable the crucial co-creation from the young learners. For schools and teachers to engage seriously in radicalisation prevention today and in the future it is not enough to integrate small elements of radicalisation prevention elements in traditional classroom teaching. This means that serious radicalisation prevention in schools by definition challenges traditional education policy. The national educational policy winds blowing over Europe is therefore to a great extent contradicting the European Commission’s innovation strategies, producing an increasing gap between European and national educational policy. The Commission’s education innovation is therefore increasingly depending in the Commission’s own funding programmes. In short, this means that European funded research and experimentation take place in a sort of vacuum not followed up or supported by national initiatives. Some professionals argue that while the Commission is making an effort to promote radicalisation prevention in schools, the national governments are indirectly producing such radicalisation. One of the most important lessons learned from radicalisation prevention experimentation and also from CHRIS is the importance of addressing radicalisation in early schooling: precisely in the years when the young teenagers are forming important elements in their identity and personality. Research clearly indicates that the prevention of radicalisation potential and the building of strong, flexible and self-reliant identities among young teenagers is the most efficient form of radicalisation prevention. - in what ways might radicalisation potential be produced and linked to identity formation in the teenage years? - in what ways might different learning and social experiences prevent this from happening? - what are the mechanisms in what we call “strong, flexible and self-reliant identities” and what is the meaning of “sustainable narratives” countering radicalisation potential? More in-depth knowledge and practical evidence in these fields is crucial to efficient radicalisation prevention in schools. Closely linked to such research and experimentation challenges are similar questions addressing the impact of innovative didactics such as open schooling on the young people’s identity formation: how are open schooling experiences in the teenage years contributing to “strong, flexible and self-reliant identities” and what are the mechanisms in open schooling creating such impact? These research and experimentation needs are highly relevant to the new generation of European educational funding programmes, such as the Horizon and Erasmus+ successors. What we know is that teenage boys and young men seem to be much more readily “radicalised” than the girls. No matter if we look at religious extremism, football violence or political “radicalisation”, we see very few girls and young women. Even if young girls and young women might increasingly be involved in such activity, the more readily radicalised individuals are still boys and young men. A general reason might be found in the fact that young boys’ “mental and social economy” is very different from young girls’. The different ways of moving through the teenage years are well known. The simple conclusion is that radicalisation prevention in schools is about teenage boys. Teenage boys and young men seem to grow much more radicalisation potential than girls – regardless of the social, economic and cultural context. Differences in this pattern might be found in 21st century youth, but on the other hand this pattern seems to be quite stable and robust across time and cultures. At least it tells us that radicalisation prevention measures in school should be extremely relevant to teenage boys. This is important as teenage boys are much less impacted by “intellectual persuasion” than girls. This form of radicalisation prevention consists, as indicated earlier, in dialogues in the class, in dialogues and discussions with radicalisation resources and in debates on what is right and wrong. Girls are more readily influenced by this “discussion discourse” than teenage boys, which is why girls are doing better in the present educational system. On the other hand boys are more readily impacted by experience from practical learning processes, action learning and through acting out their growing mental and physical energies through the learning processes. Without going deeper into this gender challenge, a first conclusion is that precisely open schooling didactics are more efficient for teenage boys than the typical educational “discussion discourse”. This underlines the need for open schooling didactics in connection with radicalisation prevention in school. The CHRIS project was developed around the following questions. HOW CAN POLICY-DRIVEN RADICALISATION PREVENTION GUIDELINES TO BASIC SCHOOLING BE TAKEN TO A DIDACTIC AND EPIC LEVEL, AND WHAT ARE THE BENEFITS OF THIS? HOW CAN SCHOOLS ENGAGE IN A STEP-BY-STEP IMPLEMENTATION OF RADICALISATION PREVENTION AT DIDACTIC LEVEL, AND HOW CAN SCHOOLS BUILD CAPACITY TO DO SO? WHAT ARE THE ROLES OF SCHOOL MANAGEMENTS AND THE PUBLIC AUTHORITIES TO WHICH THE SCHOOLS REFERS IN IMPLEMENTING RADICALISATION PREVENTION AT DIDACTIC LEVEL? TO WHAT EXTENT SHOULD SUCH SUSTAINABLE RADICALISATION PREVENTION INVOLVE, INCLUDE AND BE DRIVEN AND CO-CREATED BY THE STUDENTS THEMSELVES, WHAT ARE THE REASONS FOR THIS AND HOW CAN IT BE PRACTICED? TO WHAT EXTENT SHOULD RADICALISATION PREVENTION IN SCHOOLS INCLUDE AND PERHAPS EVEN BUILD OM AN OPEN SCHOOLING APPROACH, CREATING REAL-LIFE AND REAL-TIME DIDACTICS IN PARTNERSHIP WITH RELEVANT COMMUNITY RESOURCES, AND WHICH ARE THOSE RESOURCES? Radicalisation and similar acting out forms are extremely important European challenges. Radicalisation prevention is expected to take place across all societal sectors, including in schools and youth organisations. Radicalisation prevention in schools and in education in general is closely linked to and depending on innovation in education, such as the concept of open schooling as it is defined in this project. This is often totally neglected. Radicalisation of young people is also very closely linked to the “youth and politics” agenda: young Europeans are often assumed to increasingly disengaging from politics, democracy and European values. Young Europeans’ radicalisation and ordinary disengagement from politics and society is expected to increase in the future and may represent a very serious problem in Europe and to the European Union. It therefore makes much sense to call for a new and powerful Commission effort to engage schools, young people and communities in finding out how Europe can come to understand doing politics in new ways. In other words, Europe must acknowledge that there is a need to widen and redefine the concept of doing politics as for Europe to link in new ways to its young people. That will make Europe able to examine, wider develop and not the least support new forms of civil political engagement as to create meaningful European narratives based on the young people’s co-creation. The following critique of Erasmus+ is based on concrete CHRIS experience. The need for projects like CHRIS to engage in critical evaluation of the Erasmus+ programme is evidenced across this paper: pioneer schools and teachers engaging in demanding radicalisation prevention experimentation have very few local and national support opportunities and therefore the only programme for school experimentation in Europe, Erasmus+ and what might follow from 2020, becomes extremely important for the schools. As indicated in this paper it is increasingly difficult for schools and teachers to move and to engage in the needed experimentation.As also indicated the European programmes is one of the few opportunities for schools and teachers to engage in educational innovation, as national funding for such activities is becoming scares. Erasmus+ and its successors therefore become extremely important to practical educational innovation in Europe.It is the only Commission programme for educational innovation in practice.One single programme for changing traditional and obsolete education for the new generations of Europeans - this emphasizes the importance of the programme. Based on the CHRIS experience we ask: to what extent is the Erasmus+ programme able to create the needed support measures for schools and teachers to innovate education? We wish to point to some serious weaknesses in the programme, making it difficult for schools and teachers to use the programme efficiently.It is important to bear in mind that Erasmus+ might be the only option for most schools to raise support for the experimentation so strongly promoted by the Commission.In this perspective many schools do not quite understand why Erasmus+, as the successor of the Lifelong Learning programme, seems to have been turned into a sort of discount programme.This does not match the importance of the educational innovation, as described in this paper.In fact we have described the immense obstacles schools and teachers face when making an effort to contribute to the Commission’s educational innovation agenda. A general critique of Erasmus+ is that it has been handed over to the National Agencies.This has led to a long line of strange and less understandable practices in the different projects, as most National Agencies seem to follow own interests and administrative principles.Projects are increasingly oriented towards national interests, not towards European interests.The conclusion is that the management of Erasmus+ by the National Agencies has led to a devaluation of the programme.Several National Agencies are systematically cutting project budgets by 30-40%, making considerable co-financing necessary in the implementation. This and other NA practices seem to threaten a basic and sacred principle in European programmes: the independency of external expert evaluators.This is a serious violation of European principles and should be firmly addressed and corrected by the EACEA and the Commission.The financial structure of Erasmus+ has been simplified compared to the Lifelong Learning programme.This is in itself positive, but the simplifications have also resulted in considerable implementation difficulties for schools.The difficulties are in particular to be found in two major budget areas.School partners are now expected to implement the projects at 250 euro per month.In some countries this amount will buy one single work day per month. Taking into consideration the complications involved in this kind of educational innovation, such an amount can unfortunately only be regarded an insult and a lack of respect for schools and teachers.The extremely low funding of project implementation is a constant frustration and demotivation for most schools.The second major weakness is linked to mobility funding. A project like CHRIS is extremely student-oriented and therefore the project’s 5 days mobility event was the climax of the project – for many reasons, including the quality of the final outcomes.However, the mobility funding is so low and the rules so inflexible that it is almost impossible for partners to bring students and teachers together.Once again this leads to considerable co-funding from the partners, from parents – or from other sources; and it threatens the European dimension of the projects. The conclusion is that considering that the Erasmus+ programme for most schools is the only way to support the Commission’s educational innovation, the programme has far too many weaknesses, in the financing as well as in the management of the programme. This calls for considerable re-thinking when designing the Erasmus+ successor(s).